UFO SIGHTINGS DAILY: Ancient Pillar Found Is Evidence Of Ancient Aliens, Aug 2015, UFO Sighting News. Ancient Pillar Found Is Evidence Of Ancient Aliens, Aug 2015, UFO Sighting News. This is fantastic. A 15 ton pillar of limestone with holes mechanically drilled though it is awesome proof that intelligent beings were here on Earth long ago. This is before humans had the ability to create complex tools. Even today, moving and carving a 15 ton block of limestone would be extremely difficult if done without electrical or gas machinery. Perhaps this is close to the lost island of Atlantis, which was an alien city. At least 9,300 years ago, Stone Age hunter-gatherers in a now-submerged area of the Mediterranean Sea accomplished a feat that even most modern humans could not do: They apparently cut a 15-ton limestone pillar with precision, drilled holes in it and transported it nearly 300 meters (984 feet). The monolith is 12 meters (39 feet) long. 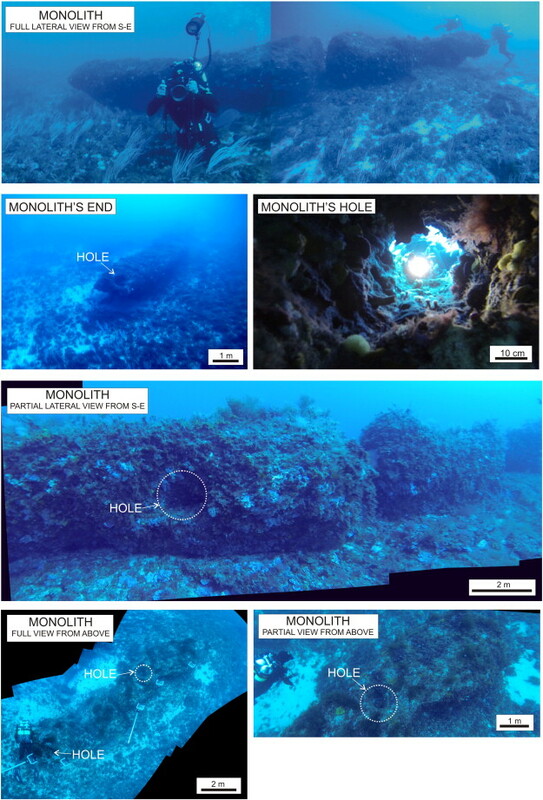 Oceanographers studying the Mediterranean sea floor in the Sicilian Channel between Tunisia and Sicily in 2012 found the monolith 40 meters (131 feet) deep. In a new paper in the Journal of Archaeological Science, the researchers say this area became submerged about 9,350 years ago, give or take 200 years. Before that, the area was shallow sea with an archipelago of several islands about halfway between the island of Sicily and the North African coast. The researchers say the discovery of this submerged pillar may require scholars to rethink the idea of “technological primitivism” among hunter-gatherers. Researchers were able to date the monolith by extracting shell fragments from it. The dating showed the pillar has the same composition and age as nearby limestone. Seawater covered the area when the last Ice Age ended around 9,350 years ago, so the pillar is assumed to have been fashioned at least that long ago.